WeatherDan is an extremely small, straightforward program that provides you with up to date weather for any configured zip code, as well as access to Weather.com for specific zip codes, and a 300 or 600 mile Doppler radar which can be animated. The configured zip codes seem to be lacking all areas, but one can compensate for this via Weather.com or a nearby zip code which is listed. 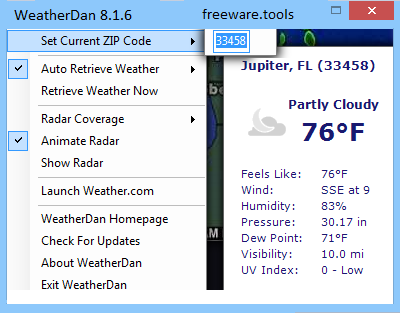 WeatherDan only uses about 3.0 MB of system memory and does provide accurate up to date weather. In other words, this is handy and small-sized piece of software that enables you to permanently stay informed about weather changes and get a real-time satellite footage. Having a gadget that can monitor weather conditions on your computer and allow you to always be informed about forecasts without checking TV news, newspapers or Internet websites is becoming more and more popular. WeatherDan is such an application that helps you monitor weather conditions and make plans for future vacations or trips. Unlike most tools of its kind, WeatherDan can be accessed from the Systray without interfering with other programs you might be working with. By clicking the dedicated icon from the Systray, you can view a small frame that displays the weather status of the specified region and parameters like temperature, wind, humidity, pressure, dew point, visibility and UV index. Right clicking WeatherDan's icon allows you to change settings. Thus, you can set the current ZIP code, change radar coverage settings from 300 to 600 miles, display radar, launch Weather.com and configure auto-retrieve weather function at the preferred time interval. The best part is that, you can apply all these changes without restarting the application or your computer. Also, there are no annoying popups or splash screens to hinder you while you are working with other programs. A unique feature is that the animated 300 or 600 mile Doppler radar allows you to see real-time satellite footages of weather changes. This map is useful for analyzing the way in which the weather is evolving in a certain region. To sum up, WeatherDan is a reliable application when it comes to provide you with detailed weather forecasts.